Monsters and robots, but the self-aware low I.Q. cornball repartee is what makes it fun. 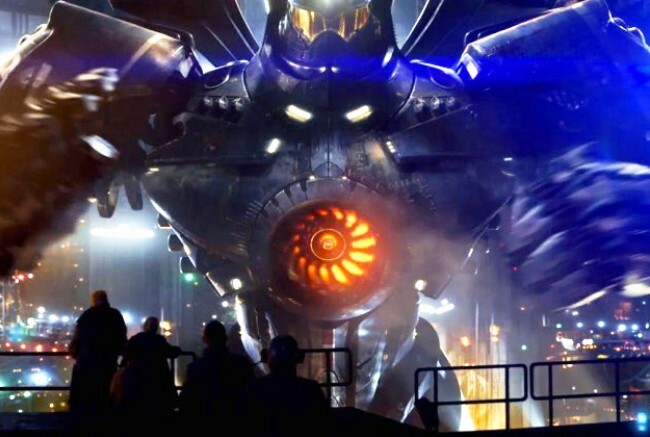 Pacific Rim posits a not-too-distant future where the Earth has been ravaged by monsters coming from the sea, via a wormhole, wrecking cities and killing the population. To effectively counterattack, world governments have united their resources to build giant robots to fight these Godzilla-Gamera-baddies. The gigantism slug-blade-rocket fighting is mindlessly awesome until you start seeing repetitive shots of it – my smile wore off and I got wary. 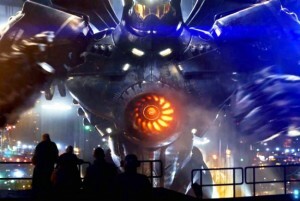 The cast is from the B-movie ranks, but they’re an entertaining group: Charlie Hunnam and Rinko Kikuchi are co-pilots within the robots, Idris Elba is the superior commanding officer, Ron Perlman as a black marketer of Kaiju (monster) organs, plus Charlie Day and Burn Gorman as two hilariously egghead scientists. 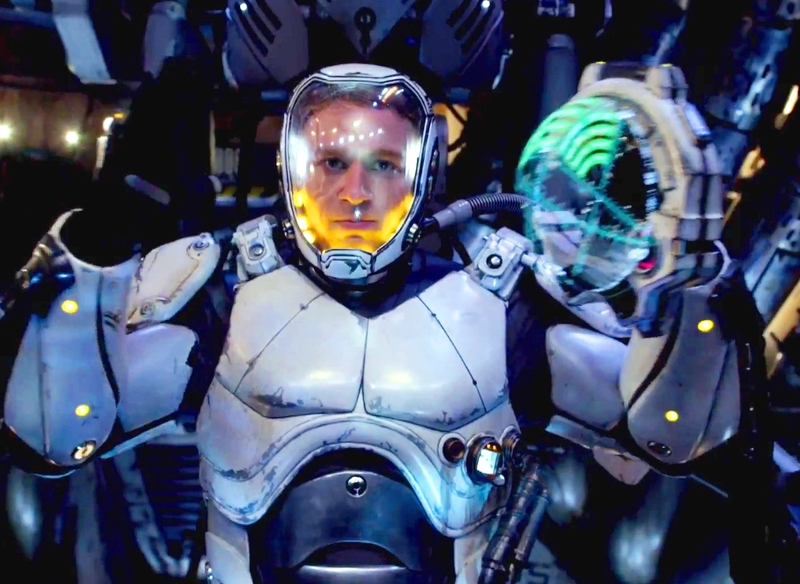 With Guillermo del Toro (“Pan’s Labyrinth,” “Hellboy”) in the director’s chair, “Pacific Rim” has more high-tech visual splendor and weird flourishes than you would get from another filmmaker. Much of the movie takes place amongst United States operative military brass in Japan headquarters, and the base itself is a massive feat of art direction. The competing geekspeak among the techs and scientists keeps the script oiled. The pilots go through a clichéd series of trust issues but you just sort of mindlessly care about them. The character arcs seem to peak though at the end of Act Two to make way for sea bank carnage. When the monsters wage war and trample the city – it’s usually at night under the rain – it’s a bit like watching a manga comic blown up in neon lights. The Kaiju from another world have been attacking for years (Just the city perimeters! Where’s the mashing of residential areas? ), one monster at a time, but the stakes become elevated when they attack in higher frequency and in pairs. Talk of “clones” suggest the Kaiju army will amplify in bigger attacking numbers. But if Hunnam’s Raleigh Becket and Kikuchi’s Mako Mori can put their innocent flirtations aside, maybe they can find the enemy’s portal in the Marianas Trench. 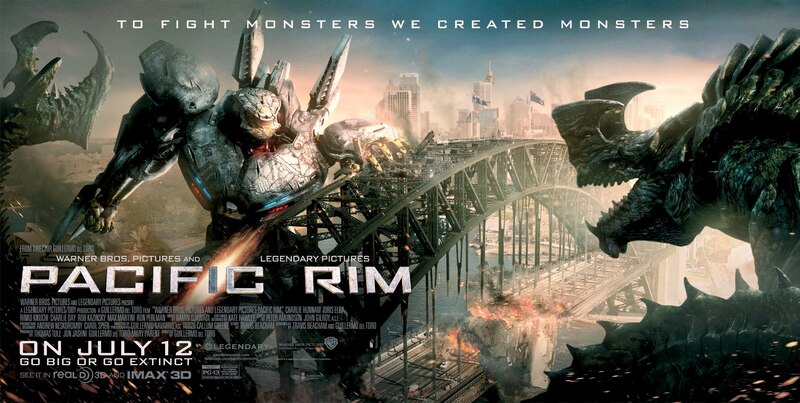 “Pacific Rim” is going to be a supercool movie for monster aficionados and creature feature fans. I am limited in appreciation for Godzilla scale battles, but was quite happy with it until I saw a too deliberate attempt to out-smash “Transformers.” Del Toro finds a rock n’ roll groove for the early action scenes, but where did it go? Such a capable filmmaker as del Toro shouldn’t lose his breezy touch, but by the last third, I was preferring the scenes where Perlman and Day dissect and analyze one of the dead monsters over the Michael Bay shot imitation testosterone. I wanted del Toro to take half his $150 million budget and build more neat-o sets with it or at least create something else new and weird, even if it were at a smaller scale. I’m not sure how many 3D die-hards are out there, but at least del Toro has made a 3D film that is… three-dimensional with full-bodied scope. I love the interface hologram computers in a first-class 3D job like this one. The falling rain on the city, too, is distinctively beautiful because you can digest the gradient downpour within the frames. This is the third best use of 3D I’ve seen employed following “Avatar” and “Life of Pi.” If Hollywood can’t do 3D as good as James Cameron, Ang Lee or Guillermo del Toro, they shouldn’t bother. All producers and directors in the industry should henceforth be put in front of a firing squad if they can’t match these 3D standards. Film Cousins: “Independence Day” (1996); “Godzilla” (1998); “Transformers” (2007); “Real Steel” (2011).